This June, CrossFit Aevitas is proud to support the Alzheimer’s Association and their The Longest Day fundraising effort! This cause has a very personal meaning to both Chad and Karen, as we have both lost loved ones to the disease (as have several members of our wonderful Aevitas community). This year, we’ve decided to give back to the organization helping to fund research, provide and enhance care, and promote education and brain health. As many of you already know, one of the best ways to promote brain health and reduce the risk of cognitive decline is living a physically-active lifestyle. So what better cause to support than one which directly correlates with our motto of “Fitness For A Lifetime”?! 2 - Complete as many items on the BINGO card as you can before Saturday, June 23rd. 3 - Join us on Saturday, June 23rd at 10:00AM for a special tribute WOD, delicious food from Food Therapy, 15-minute body work sessions from Megan and Erika, and a raffle with fabulous prizes! Event will go from 10-12, so if you can’t make it for the WOD, join us at 11 for the raffle and other happenings! NOTE: you’re not limited to one card - purchase more and get your friends/family/coworkers involved too! Everyone who purchases a BINGO card will have their name entered into a raffle drawing during the June 23rd event. ALSO, everyone who is able to COMPLETE THE ENTIRE BINGO CARD by the event will be placed in a second, even more fabulous raffle drawing - so do your best! We have already generated over $1,000 worth of prizes, FYI. Things like chiropractic care, massage, lulu gear, activity vouchers to local establishments, free food and drinks… just to name a few! We hope that you’re as excited about this month’s cause and event as we are! 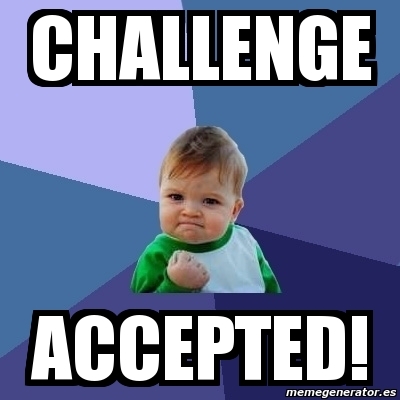 Challenge accepted? !